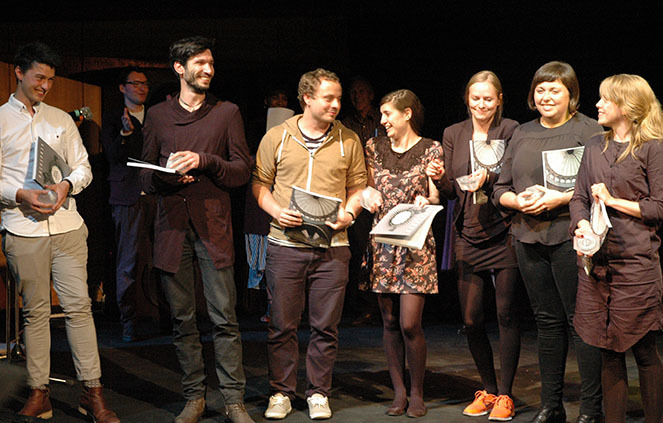 The winners of the Archiprix International / Hunter Douglas Awards 2013 are…. For the 2013 edition Archiprix International received 287 projects from 76 countries. Architect, academic and a best-selling novelist Lesley Lokko and Aleksey Muratov editor-in-chief Project Russia Magazine announced the winners of Archiprix International / the Hunter Douglas Award in Moscow on May 24th 2013. David Adrian O’Reilly, Andreas Brinkmann, Hugon Kowalski, Almudena Cano Pineiro, Lisa Tiedje, Susana Sepulveda General, Greta Tiedje, and (not on the photo) Yongming Chen, Yanming Cheng and Zhen Li. Archiprix International is an international network for young, talented architects, urban designers and landscape architects throughout the world. Biennially all universities worldwide are invited to select and submit their best graduation project. Of all submitted graduation projects an international jury straddling a broad range of design practices and design cultures nominated 25 for an award. Out of these nominees 7 winners were selected. Many of the 287 graduation projects show, as the jury called it, a kind of 'new social consciousness' in architecture. Most problems the world has to deal with are complex and are impossible for architects to solve. What the winning projects have in common, according to the jury, is that they give a simple yet effective answer through architecture to these complex problems. The winners recieve an award object and prize money. The jury members for the Archiprix International 2013 were Yuri Grigoryan, architect and director of the Mocow-based Project Meganom, and director of the educational programme at Strelka, Moscow. Landscape architect Susan Herrington, Professor of Architecture and Landscape Architecture at the University of British Columbia in Vancouver, Canada; Kristin Jarmund, architect and director of the Norwegian-based Kjark; Hubert Klumpner, architect, director of the Venezuela-based Urban Think Tank, and Professor of Architecture and Urban Design at the ETH Zurich; and Lesley Lokko, architect, academic and a best-selling novelist from the U.K.